sample image 12 V underbody socket for retrofit. Not suitable for a cigarette lighter! 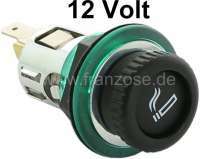 sample image 12 Volt assembly socket to conversion (suitable for a cigarette lighter). Assembly orifice: 29mm. Depth: 48mm. sample image 12 Volt cigarette lighters. Universal suitable. sample image 2CV 6 NJHC decoration set (2CV NJHC ovvero Nederlandse Jeugdherberg Centrale), completely. 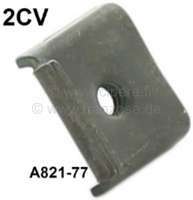 Suitable for Citroen 2CV6 (special design). Color: grey - red. sample image 2CV, B-support sheet metal cover above. For vehicles with suicide door! sample image 2CV old, floor pan, cross bar at the chassis in the rear. This cross-beam is welded at the chassis. On this cross-beam the floor pan of the body rests upon. 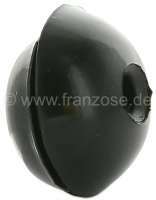 Suitable for Citroen 2CV of the first version! sample image 2CV old, floor pan, cross bar at the chassis in front. This cross-beam is welded at the chassis. On this cross-beam the floor pan of the body rests upon. 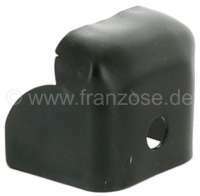 Suitable for Citroen 2CV of the first version! sample image Citroen Chevron, 4 pieces, suitable for corrugated sheet hood, for Citroen 2CV from 1954 to 1961! sample image 2CV old, tail pipe for on the right mounted exhausts. 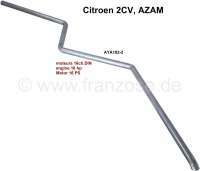 Suitable for Citroen 2CV 16HP, 2CV AZAM. The exhaust pipe is mounted on the right, and is diagonally under the trunk floor and ends on the left side! sample image 2CV old, window handles outside, on the left + on the right fitting. Old version out of rubber. sample image Rear end panel, diagonal version! 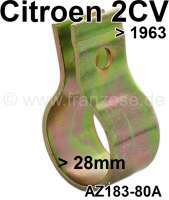 For Citroen 2CV to year of construction 1963. Made in Europe. sample image 2CV old, fender in front on the left, without cutout for the indicator, with cutout for the exhaust air hoses (engine cooling system). 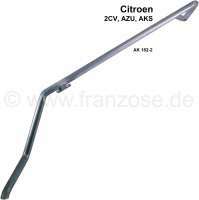 For Citroen 2CV of the first years of construction, which have only lateral indicators at the C-support.